Charlie Asher has one of the best and worst days of his life all on the same day. The day that his daughter Sophia is born is also the day that he looses the love of his life, Rachel, as well as become the newest Death Merchant (though he doesn't know that yet). Though he does notice that people seem to be dying all around him and he starts to hear whispers coming from the sewer drains, but he can just chalk this up to his Beta Male imagination. But Charlie is about to find out that he has a greater purpose in life and it is up to him to help keep the balance between the dark and light. It turns out to be a pretty dirty job, but someone has to do it. 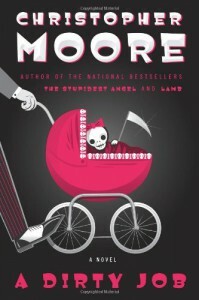 Moore has created a really fun, cute, funny, quirky and very interesting/creative take on Death (as in the one that passes on the souls, not actually dying, though they do tend to go hand in hand). Death Merchants as they become known in the books are there to help the souls of those who have passed not only find a new body to reside in but to also keep them out of the dark hands. I found it really interesting that Moore did not have everyone have a soul instead a soul is passed on to a person who is right for that soul. In a way it was a type of reincarnation that I have never heard of before. Where the soul moved on to before the right person came along was also interesting as it went into something inanimate that was extremely important to that person. There are some funny ones and I question how the soul would move on from that object, Charlie would have to be very creative not only to retrieve it but to get it to it's new owner. I think the only thing that I did not like about this book is that at times it was predictable. You often hear men being referred to as Alpha males in book, actually more often than not your main character is a Alpha male. Not so in this book. Moore makes it a point to show Charlie, The main character, as a Beta male and how being a Beta male not only affects his life but also his decision making process. This is not to say there is not an Alpha male in this story, I would say that Minty Fresh (yes that is the character's name) would fill the role of Alpha male. I really liked Charlie as a main character, he is very witty, very aware of his flaws as well as his strengths and really tries to adjust to being Death as well as one can expect. Also being a new Dad is stressful as well trying to raise a little girl who seems to have some interesting abilities herself (i'll never think of the kitty the same again) everything just seems to pile up on Charlie but he takes it in stride. For the most part when things happen he is very calm and thinks things through before springing into action. There are some secondary characters that have parts told from their point of view, however, I do not think that they are as fleshed out as characters as Charlie is. Moore has enough there to make them interesting and at times weird but that is about it. There are some laugh out loud moments in this book and I really enjoyed reading this book and looking forward to seeing what happened next to Charlie especially when the Hellhounds were around. I didn't realize that this is the first book in a series till I added it on goodreads. It will be very interesting to see how Moore creates the second book in the series just based upon how this one ended but I really look forward to finding out.